Early on the morning of October 23, 1864, Confederate Major General Sterling Price knew he had a big problem. 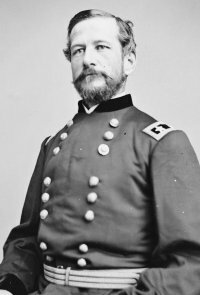 He had gotten his army across the Big Blue River, but was faced with Union Major General Samuel Curtis' Army of the Border on his front and Union Major General Alfred Pleasonton's Cavalry Division nipping at his heels. The day before he had sent his massive wagon train and cattle herd southwest towards New Santa Fe, but it was moving slowly and had not yet gotten across the Big Blue River. The plan did not go well for the Confederate Army. 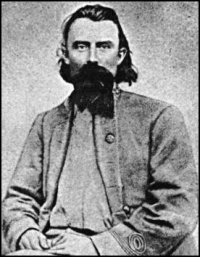 At first light in Westport, Curtis sent Major General James Blunt's Division to attack the Confederate Divisions of Fagan and Shelby. Although these attacks were unsuccessful, by mid-morning the Federals were able to find a way around the Confederate left flank. Meanwhile, Pleasonton forced a crossing of the Big Blue River at Byram's Ford and drove Marmaduke's defenders scrambling back towards Westport. Once across the river, Pleasonton pressed his attack on the exposed right flank of the Confederates. The only that saved the Confederates was a courageous defensive stand made by Jo Shelby's Division. With the rest of Price's army retreating in panic, Shelby's rear guard action held off the advancing Federals and allowed the Confederates to escape. 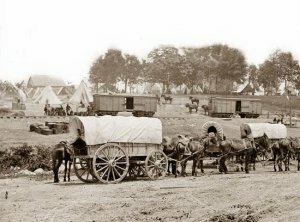 About the only thing that went well for Price that day was that his wagon train was able to cross the Big Blue River, reach New Santa Fe, and was headed south. This was probably the last thing that went well.